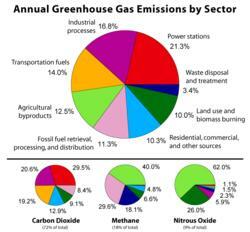 Greenhouse gases (GHGs) are gaseous components of the atmosphere that contribute to the "greenhouse effect". Although uncertainty exists about exactly how earth's climate responds to these gases, global temperatures are rising. Some greenhouse gases occur naturally in the atmosphere, while others result from human activities. Naturally occuring greenhouse gases include water vapour, carbon dioxide, methane, nitrous oxide, and ozone. Certain human activities, however, add to the levels of most of these naturally occurring gases. When sunlight reaches the Earth's surface, some is absorbed and warms the earth. Because the earth is much cooler than the sun, it radiates energy at much longer wavelengths than the sun. Some of these longer wavelengths are absorbed by greenhouse gases in the atmosphere before they are lost to space. The absorption of this longwave radiant energy warms the atmosphere (the atmosphere also is warmed by transfer of sensible and latent heat from the surface). Greenhouse gases also emit longwave radiation both upward to space and downward to the surface. The downward part of this longwave radiation emitted by the atmosphere is the "greenhouse effect." The term is in fact a misnomer, as this process is not the primary mechanism that warms greenhouses. The major natural greenhouse gases are water vapor, which causes about 36-70% of the greenhouse effect on Earth (not including clouds); carbon dioxide, which causes 9-26%; methane, which causes 4-9%, and ozone, which causes 3-7%. Note that it is not really possible to assert that a certain gas causes a certain percentage of the greenhouse effect, because the influences of the various gases are not additive. * use of CFCs in refrigeration systems, and use of CFCs and halons in fire suppression systems and manufacturing processes. According to the global warming trend, greenhouse gases from industry and agriculture have played a major role in the recently observed global warming. Carbon dioxide, methane, nitrous oxide and three groups of fluorinated gases are the subject of the Kyoto Protocol, which entered into force in 2005. Methane, nitrous oxide and ozone-depleting gases are also taken into account in the international agreements, but not ozone. Note that ozone depletion has only a minor role in greenhouse warming, though the two processes often are confused in the popular media. Based on measurements from Antarctic ice cores, it is widely accepted that just before industrial emissions began, atmospheric CO2 levels were about 280 parts per million by volume. From the same ice cores it appears that CO2 concentrations have stayed between 260 and 280 parts per million during the preceding 10,000 years.